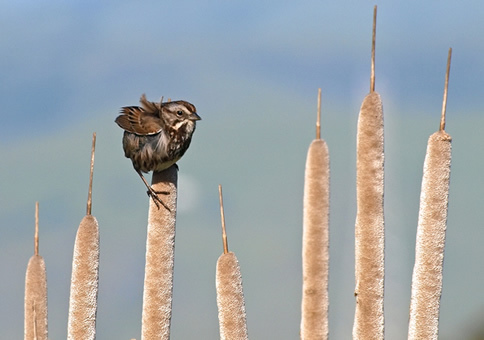 Welcome to San Francisco Baykeeper's April E-News. Baykeeper is working to end the destructive and unregulated practice of fracking to extract gas and oil from wells across California. Fracking (hydraulic fracturing) is the process of injecting millions of gallons of water, sand, and toxic chemicals underground at high pressure to extract oil or gas. Fracking is currently being used in hundreds of California gas and oil wells, some within the San Francisco Bay-Delta watershed, with no regulation. 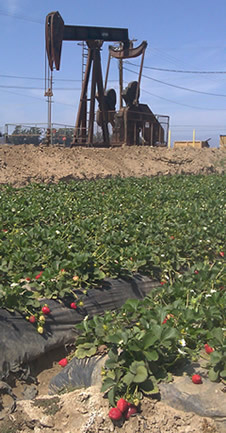 Read more about Baykeeper's work to end fracking in California. Baykeeper has begun removing up to 100 tons of debris that has been polluting San Francisco Bay waters and the shoreline at Point Molate in Richmond. Currently, the beach is blighted by hundreds of pilings contaminated with creosote, a now-banned wood preservative that poses a threat to both wildlife and people. Other debris includes metal shards, tires, and other large objects. The cleanup will make the beach safer and cleaner, help restore damaged habitat, and help facilitate the re-opening of a closed city park. We need volunteers to help with the cleanup this Saturday, April 20, and on future weekend dates. Volunteers who can lift 50 pounds are especially needed, and we can also use help with smaller debris. 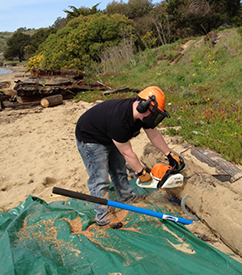 Find out more and volunteer to help clean up the beach at Point Molate. 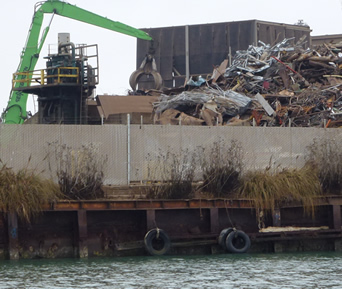 For the second time this year, thanks to Baykeeper's advocacy, a polluting metal and vehicle recycler on the Oakland Estuary has been told it is still not doing enough to keep toxic dust out of San Francisco Bay—and that it must do better. Schnitzer Steel was already under tighter pollution control requirements as a result of previous Baykeeper recommendations to the Regional Water Board. But Schnitzer responded by turning in vague and inadequate pollution prevention plans. Baykeeper documented the weakness and ineffectiveness of Schnitzer's pollution prevention efforts. As a result, the Board is requiring Schnitzer to replace its vague plans with clear, objective measures of pollution and specific prevention practices. Read more about Baykeeper's advocacy for cleanup of Schnitzer's toxic pollution of the Bay. 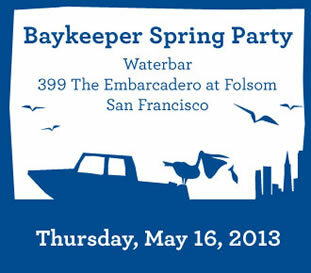 Support Baykeeper's work to protect San Francisco Bay at our 2013 Spring Party! Join us for an inspiring evening to benefit our work to protect the Bay from pollution on Thursday, May 16, 6 to 8 pm. Enjoy drinks, hors d'oeuvres, a silent auction, and stunning Bay views at Waterbar Restaurant on the San Francisco Embarcadero. Tickets begin at $75 and are on sale now. All purchases benefit Baykeeper's work to make the Bay clean and healthy. Find out more and purchase tickets to the Baykeeper Spring Party on May 16. Earth Day is April 22. On Earth Day, and every day of the year, you can take simple actions from your home and in your community to help protect San Francisco Bay from pollution. Here's one tip: Don't put medications down the sink or toilet. When medications like antibiotics, anti-depressants, and birth control pills are flushed down the toilet, they aren't removed by the wastewater treatment process. These pharmaceuticals persist in the environment, altering the natural state of the Bay and endangering aquatic life. Take unused medication to a proper disposal facility, or put them in a sealed container and in the trash. Get more Earth Day tips for a healthy San Francisco Bay.